Courtney is simply amazing! Not only is she an incredibly talented florist she is one of the sweetest people I have ever met! We were planning our Virginia wedding from Charleston, SC where we live now & Courtney helped make the planning process so much fun & stress free! We had countless FaceTime calls and every time we were back home in VA she was always willing to come meet with us in person! Courtney transformed a very modern looking ballroom into a rustic, greenery filled, beautiful room for our reception- it was breathtaking! I had endless compliments on my bridal bouquet & the floral arbor for our ceremony! Courtney was a dream to work with & her floral designs truly made our ceremony & reception exactly what we had always wished & hoped for!!! We cannot thank Courtney & her team enough for everything they did for us!!! If you can snag Courtney Inghram Floral Design for your big day I promise all of your wedding floral expectations will be exceeded!! Having Courtney as our florist was one of our best decisions. I wouldn't even say we "hired" her because it didn't feel like this was a business transaction for her, it felt really personal. She was always available to meet on Skype or in person and answer all our crazy questions, and never made us feel silly for those questions. The day of the wedding I was BLOWN AWAY by the arrangements she made. I get so many compliments on my florals and I never hesitate to recommend Courtney to anyone else. She's truly an amazing person, florist, and vendor! Courtney was absolutely fabulous! My fiance and I were living in Florida while planning our wedding back home in Virginia Beach. I was nervous about finding vendors that could see my vision from so far away. But after my first consultation with Courtney, nerves were put at ease and excitement set in. She took the time to listen to what I was envisioning while at the same time offering her expertise. She stayed with me through the whole process and by the time of our wedding, I thought I knew what I was getting...and was so excited! However, everything turned out 10X better than my imagination! She captured everything I possibly wanted and made it that much better. I adored my bouquet that captured my personality so well. Another favorite was this eucalyptus greenery that went along the back of my ceremony chairs and was repurposed for my head table..it was so lush and beautiful that everyone couldn't believe it was real! Courtney was incredible and if there was a rating greater than 5 stars she would receive it from my now husband and I without question! Where do I start?! Courtney was absolutely amazing from the first time we talked on the phone all the way to helping us get ready on our wedding day. She made the bouquet of my dreams, as well as all the other florals she did for the day... they could not have been more perfect! The florals she did truly helped make our day beautiful and I am so thankful for the friend I have found in Courtney through this whole process. I would recommend her 100%! "All I can say is WOW. Courtney absolutely nailed my vision for a winter wedding! She's not only great at executing ideas, she's an absolutely amazing listener. I knew that flowers can make or break a space so DIY was completely out of the question. I'm so glad we trusted Courtney with the reins! She provided the lush greenery, neutral colored blooms, gold accents, and a massive eucalyptus garland that complimented our venue perfectly. I knew we needed additional decor and we were able to bounce ideas back and forth ironing out the specifics. They looked great! Our guests still rave about the flowers till this day! After our very first Skype meeting I knew I had made the right choice. She just "got me". I live near Baltimore, her office was in Richmond, and the venue was in Charlottesville, so trying to coordinate a wedding in a city you've only visited once (for 30 minutes) was tough. Luckily Courtney understood and worked diligently to make the planning process as easy as possible. I'm so glad I came across her Instagram page months ago. I adore her work and now I'm a CIE bride for life!" 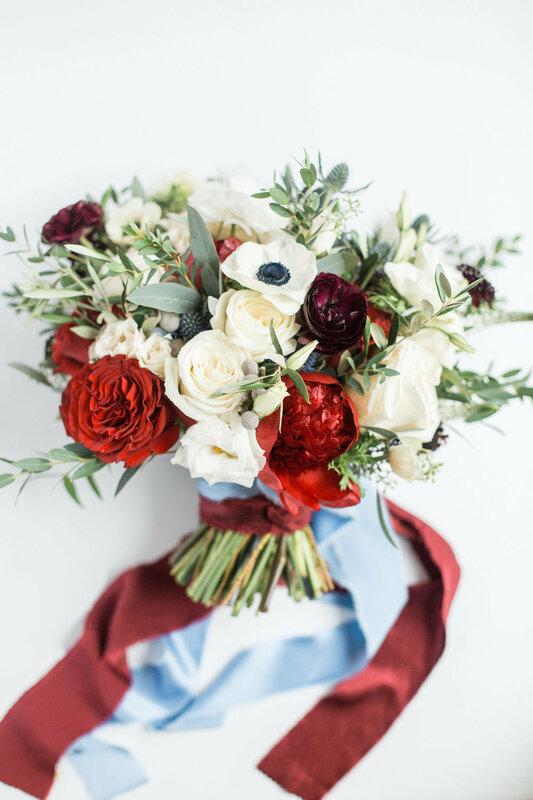 I could not have asked for more gorgeous wedding flowers or a better experience with Courtney! I was so impressed by how quickly and thoroughly she communicated with me through the entire process. She listened and understood my ideas, and gave amazing suggestions as well. Even her proposal was incredible, with the names and pictures of each type of flower as well as inspiration photos so that I could easily see what we had talked about. Courtney went above and beyond to make sure my flowers were perfect and that the day went smoothly. She is so genuinely nice, in addition to being such a talented and creative florist. 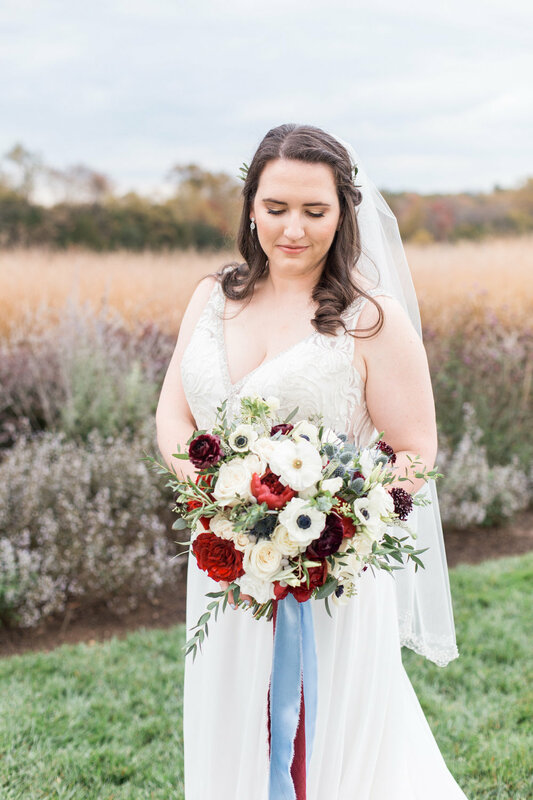 My flower crown, bouquet, and eucalyptus garland were honestly some of my very favorite elements of my wedding day thanks to Courtney! Courtney was an absolute dream come true! We had an outdoor ceremony and she literally transformed the space with her creative vision. Her florals - from the bouquets, table arrangements and installations - were jaw-dropping gorgeousness. Courtney was also so professional, very responsive and so easy to work with that I would highly recommend her services. I kept telling her I just wish I could have hung out with the flowers longer! They were THAT beautiful! !